VSM Engineering has designed over 34,000 linear feet of water main replacement in the past five years; projects have included design, planning, analysis, construction plans and construction contract administration. Sanitary sewer gravity lines ranging from 8-inches to 36-inches. VSM provided engineering support for the design analysis and study for the chilled water at the KCI Airport. Construction plans were developed for the replacement and rehabilitation of 11,000 LF of chilled water line; 12-inch, 16-inch, and 24-inch pipes, including 5530 LF of 12-in CIPP Water Line. 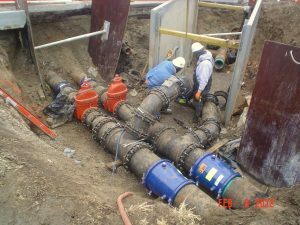 The project required extensive routing and alignment in a severely congested environment, determination of valve locations for operations improvements, daily coordination with parking operation and terminal operation and sediment and erosion control. 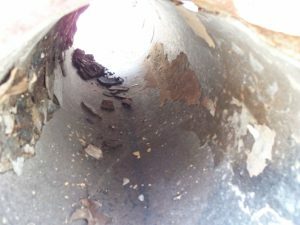 The pipeline replacement included boring, open trench and CIPP pipe repairs. As prime, VSM is providing Water Line Design and Utility Coordination and Relocation services for the replacement of approximately 5,400 linear feet of 6-in water main. Prime SLBE for the 2,927 LF of 6-in and 2,459 LF of 8-in water main replacement. Developed construction plans for 6900 LF of 6-in through 12-in water main replacement. The design included coordination with utilities and design of connection details. 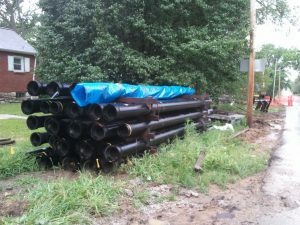 Designed 1400 LF of 6-in water main replacement as part of the Jackson-Brighton water main relocation project. Included coordination with utility and design of connection details. VSM designed construction plans for 2,400 Linear Feet of 6” & 8” water line for a new commercial subdivision on NE Parvin Road and N. Arlington Avenue in Kansas City, MO.